samantha stosur | Make Time For Sports. Australian tennis star, Samantha Stosur, admits that she’s a grunter as well. Her statement came in the wake of No.1 Caroline Wozniacki’s remark that some players use the sounds to their advantage. Sam Stosur is in splits as she considers purchasing stamps commemorating her 2011 US Open victory. The special issue souvenir sheet was issued by Australia Post retailing 10*60 cents Southern Cross for AUS $15.95. I’m really excited Australia Post has decided to release a souvenir stamp sheet to celebrate my US Open win. The past couple of weeks have been very exciting and I’m still coming to terms with the idea of being a Grand Slam winner. This is something I’ll remember forever. 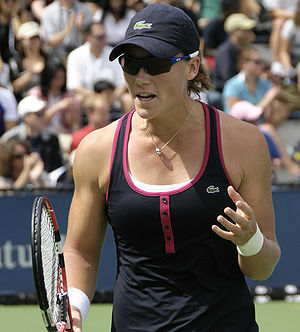 Samantha Stosur had the advantage of two major semifinal appearances over her German opponent, Angelique Kerber, at the US Open. When Samantha Stosur took on Francesca Schiavone in the 2010 French Open final, she was the favourite. That was not the case in her final match-up against Serena Williams at the 2011 US Open. Serena dropped nary a set on her route to the final. Stosur, on the other hand, let many an opportunity to close matches early slip through her nervous fingers. However, it was the Australian, much like Petra Kvitova at Wimbledon against Maria Sharapova, who exhibited nerveless character in the role of underdog. She was calm, composed and assured in her demolition of the 13-time Grand Slam champion. Samantha Stosur has a fresh appendage against her name. The Australian No. 1 was referring to a code violation she received for an audible obscenity in her match against Maria Kirilenko in the fourth round of the US Open. I never had one. The only disappointing thing to come out of the match. I’m not proud of it, but I guess I released whatever I had to release and moved on. Yeah, I guess I’m trying as hard as I can out there and don’t want to leave anything out there. You don’t want to get a code violation or do something wrong, but if that’s what you have to do to release it and be able to play the next point well, then so be it. Wimbledon, the Williams and Caroline Wozniacki. The trio of Ws coming together could generate more than enough hype and hoopla to keep sports writers busy for the next 14 days. Maria Sharapova is making headlines—not for her fashion sense, boyfriends or her clothing line—but for her tennis. A fabulous run at the French Open reminded players and fans alike why she was considered one of the most exciting talents to burst onto the WTA tour at 17. Li Na—her first ever major at Roland Garros—and a billion-plus Chinese fans ignited a Marco Polo-like rush to discover the next Chinese star. The withdrawal of Kim Clijsters—an aggravation of her ankle injury—means that the Belgian is—for all practical purposes—-hobbled in her farewell year. No Kim Clijsters, no Caroline Wozniacki, no Samantha Stosur. The women’s round of 16 has a threadbare appearance. Three big upsets in the first week tells a tale of the unpredictability visited on the WTA tour—absent the Williams sisters. Fans are so used to seeing Serena Williams perched atop the rankings that they failed to note the depth in the lower rungs. This year’s French Open is not about Roger Federer. Was it ever? Except for that little aberration in 2009, with Rafa missing. 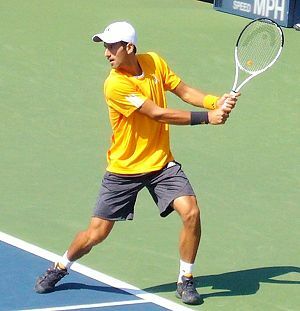 It’s centres on that Serbian upstart Novak Djokovic and that muscled monster, Rafael Nadal. Up until the 15th of May 2011, Maria Sharapova had two clay court titles under her belt. Strasbourg 2010 and Amelia Island 2008 were her only clay court trophies of 22 on the WTA Tour. But not now. With her victory over Samantha Stosur at Rome on Sunday, the Siberian staked her claim to the French Open this year.She stalked her adversaries and crept up on her prey, unsuspecting. Beware—Maria, the huntress, is on the prowl. 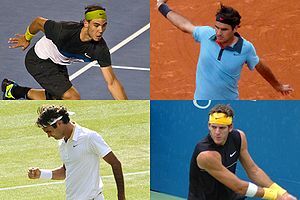 Will 2011 see more head-to-head matches between Roger Federer and Rafael Nadal? The man from Mallorca certainly hopes so. “I would love to play against Roger Federer this year a few more times because when we play each other it’s in the final, so that’s already a very good result for both of us to be in the final of important tournaments,” said Nadal. The recent invitational Abu Dhabi tourney finished with Nadal edging out Federer in two sets 7-6, 7-6. Here’s a toast to the New Year and more exciting tennis and finals between the supremoes of the sport.